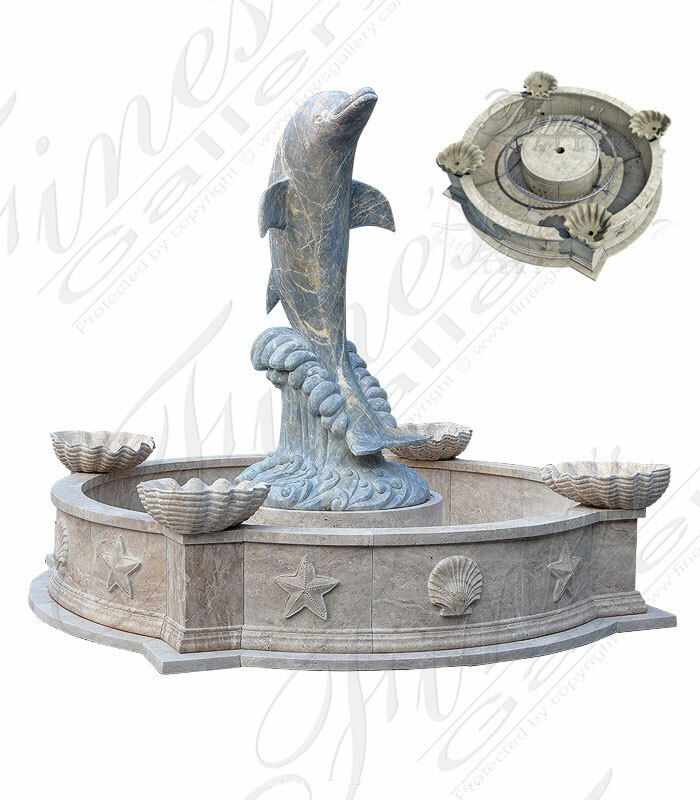 Celebrate South Florida with this magnificent Marble Dolphin Fountain with Sea Themed Shell Pool Surround. 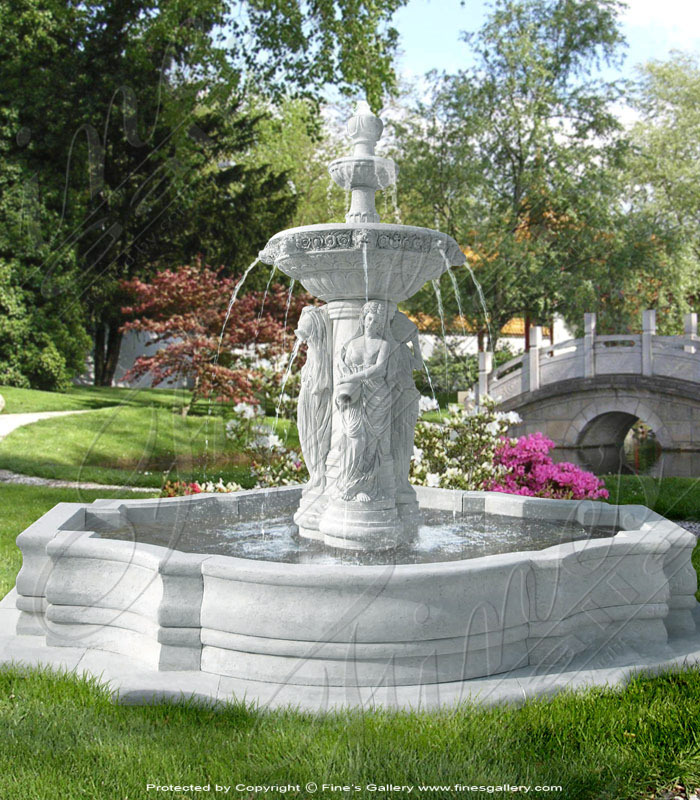 Carved from an exotic blue gray marble. Accompanying the dolphin is a sea themed travertine pool surround. Dimensions: H: 85" W: 99" D: 99" View Colors Call Us! 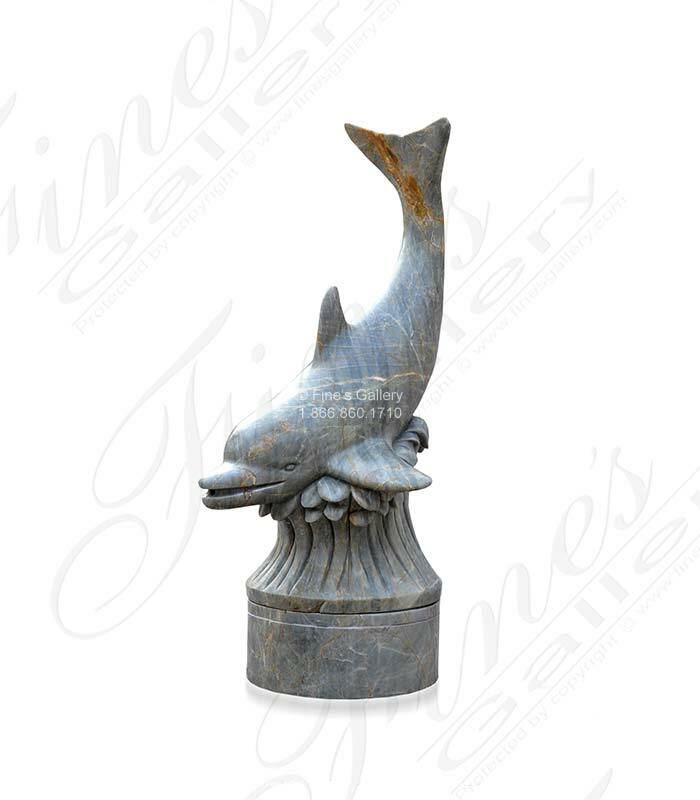 Two playful dolphins carved from a solid block of breccia antique marble. 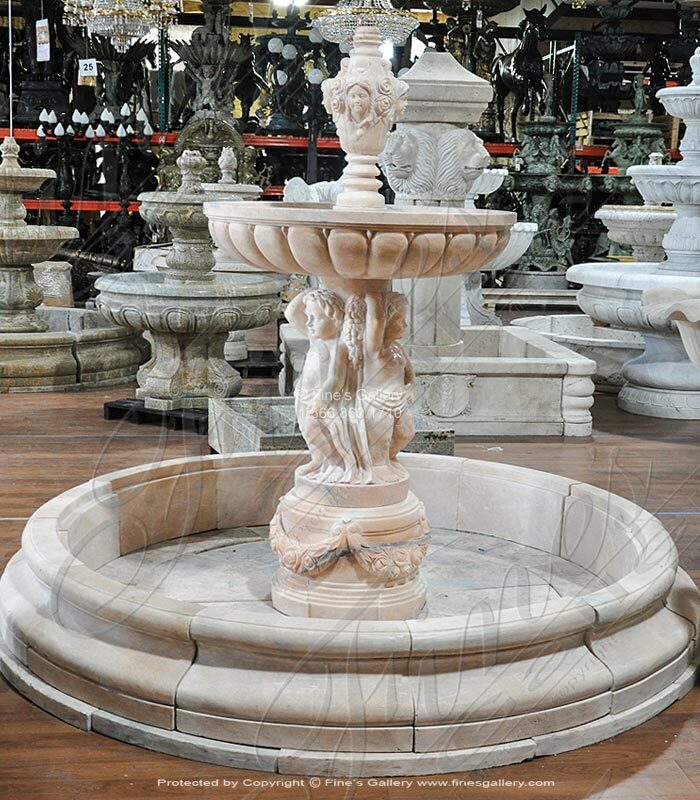 Included an antique white marble pool basin and bowl. Commercial grade water jets included! Call for details at 1.866.860.1710. Dimensions: H: 77" W: 120" D: 120" View Colors Call Us! 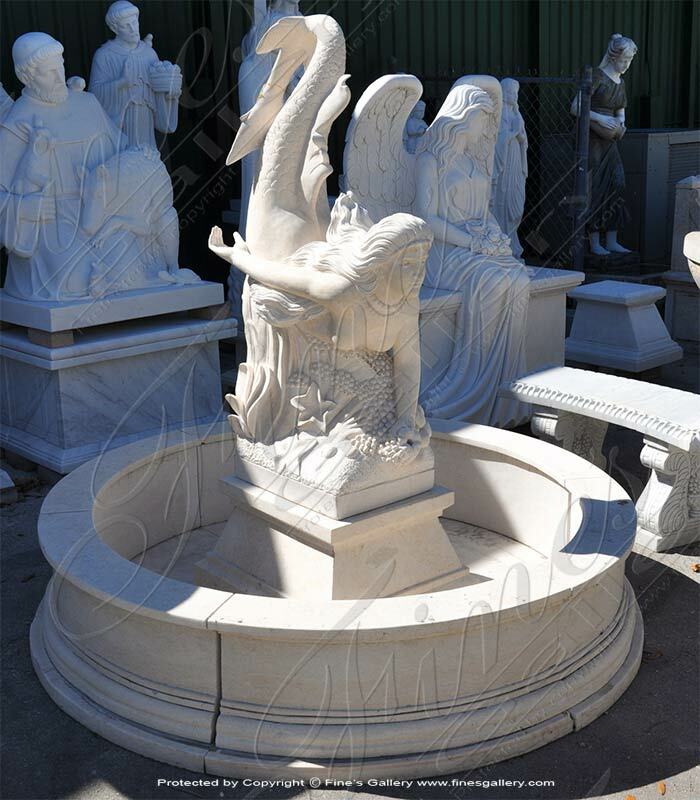 Roman Greco Travertino Fontana Luxurious Statuary Fountain carved from natural solid marble. 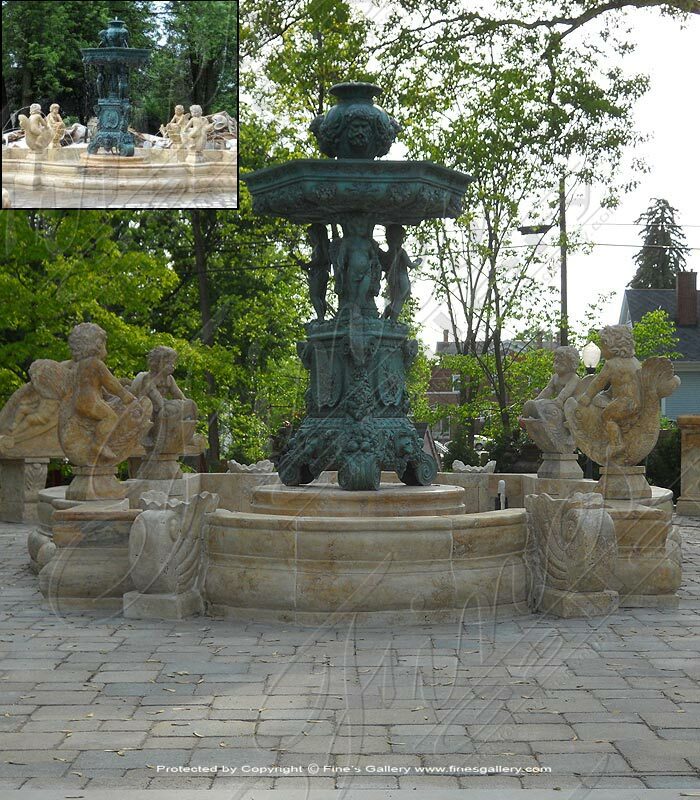 We have designed thousands of roman greco style natural stone fountain features that have been installed world wide! Available in white carrara marble! Dimensions: H: 121.75" W: 68" D: 68" View Colors Call Us! 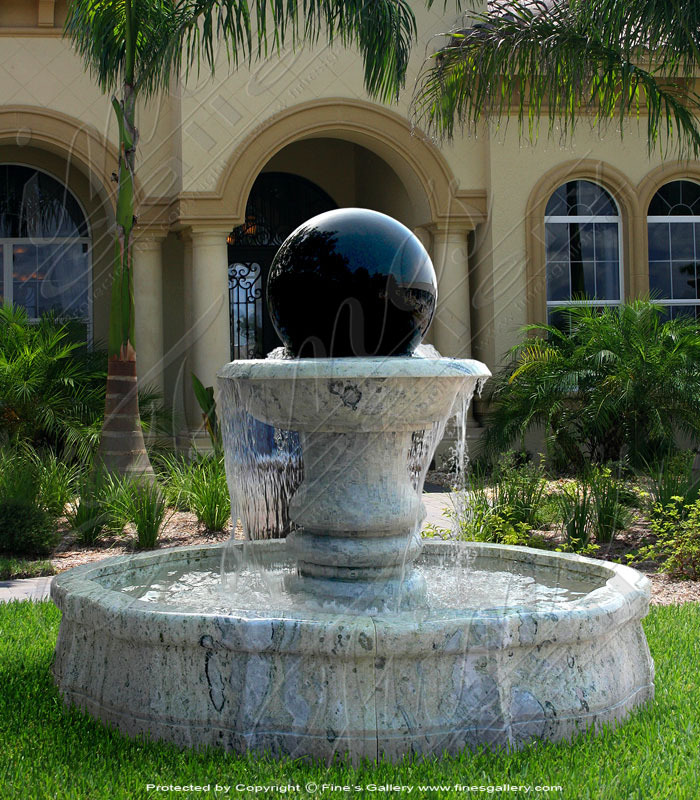 A beautiful two toned marble sea horse marble fountain designed by Fines Gallery of Bonita Springs, FL. 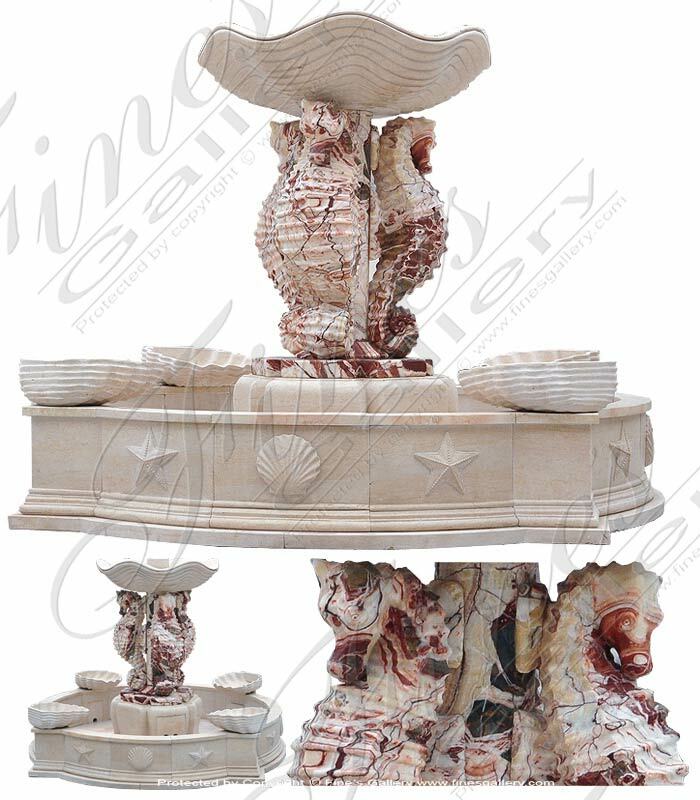 Featuring exotic red, white and cream marble. Lots of water action from the top shell tier & each of the four smaller shells. Dimensions: H: 55" W: 76" D: 76" View Colors Call Us! 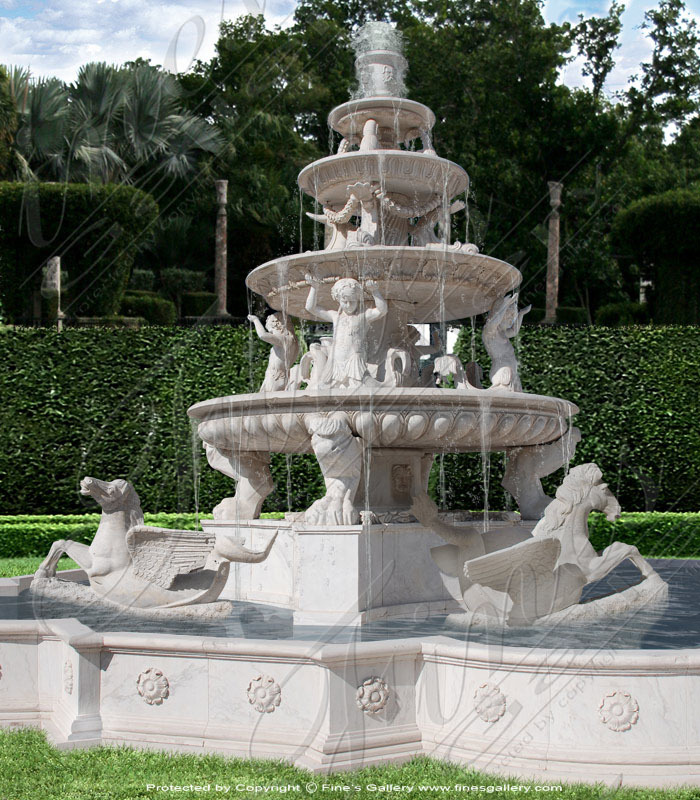 This gorgeous daydreaming Venus marble fountain will become a symbol of wealth and luxury within your estate grounds. A fascinating beauty loungeson a rosedecoratedbasein the center ofa lavishcornucopia pool. Dimensions: H: 55" W: 88" D: 88" View Colors Call Us! 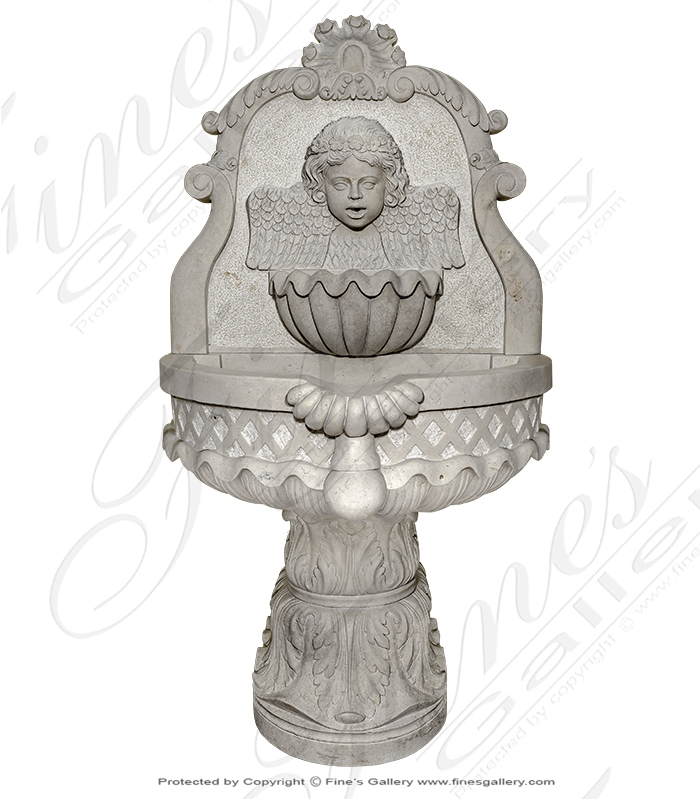 Cherubs & Garlands Fountain carved from solid rosetta marble including beautiful 8 foot diameter pool surround. 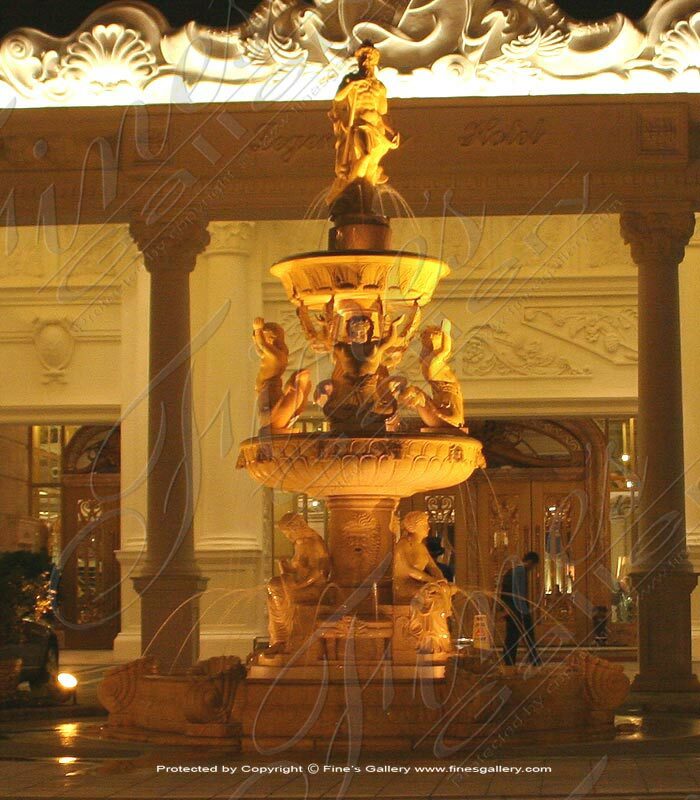 A light pink natural marble with gray veins featuring rose garlands and Italian Children theme throughout. European influenced Italian style. Dimensions: H: 78" W: 97.5" D: 97.5" View Colors Call Us! 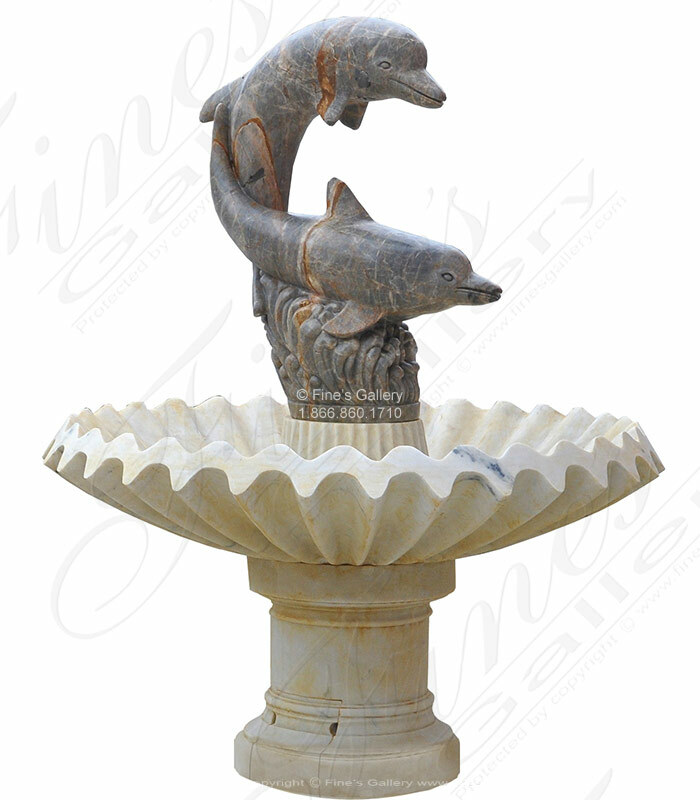 A breathtakingly beautiful marble dolphin pair carved from 100% natural solid marble. This unique marble grayish blue with white and pastel veining. 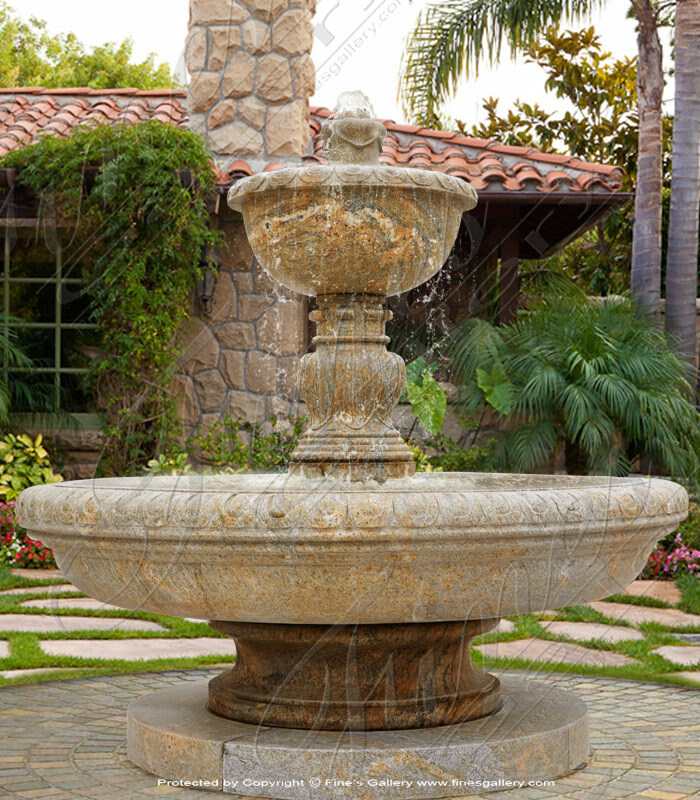 Included is solid white marble pedestal and bowl along with a stainless steel water jet spray system! Dimensions: H: 74" W: 61" D: 61" View Colors Call Us! 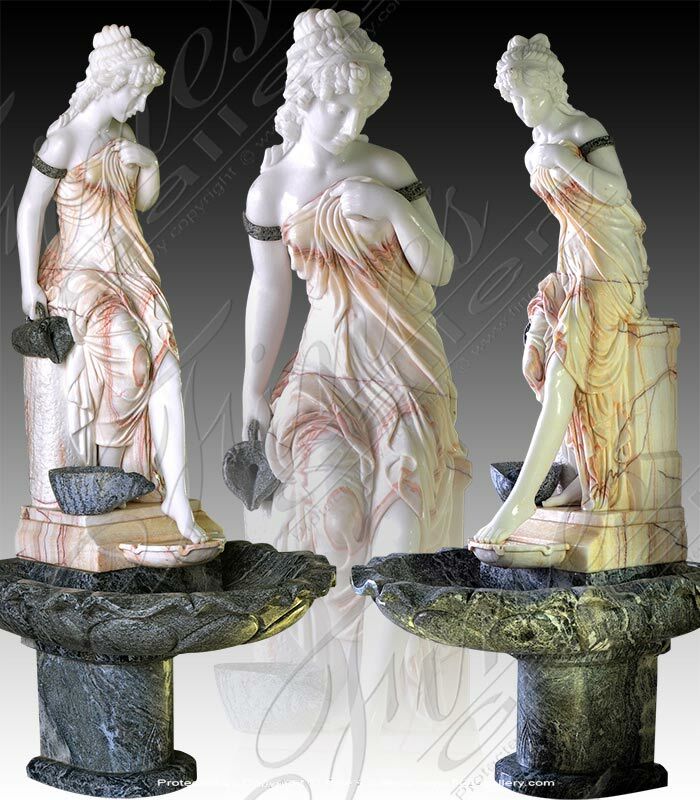 A beautiful light cream marble mermaid fountain. Water spouts from the front of her into a pool below. Stainless steel water ring sold separately shoots water towards the mermaid. Dimensions: H: 67" W: 72" D: 72" View Colors Call Us! Marble Bather made famous by Falconet. 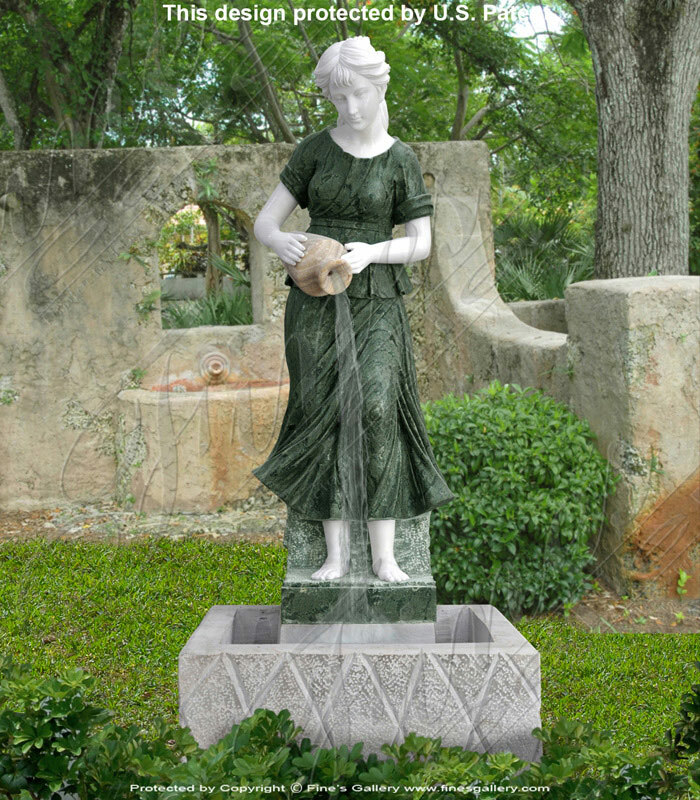 This elegant carved marble fountain depicts a woman pouring water from her vase. 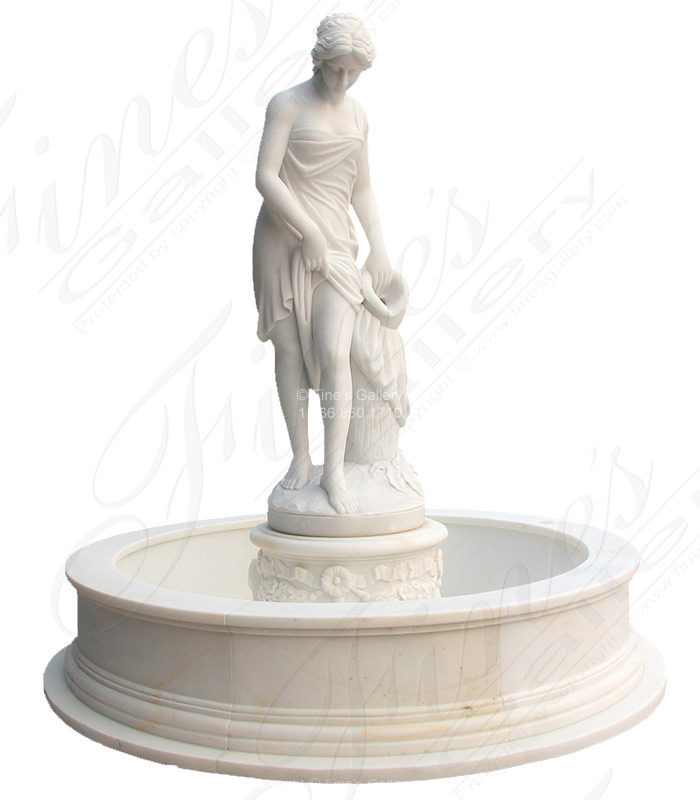 Carved from pure white marble included with ornate carved marble pedestal and a clean lined marble basin to match. Dimensions: H: 80" W: 72" D: 72" View Colors Call Us! 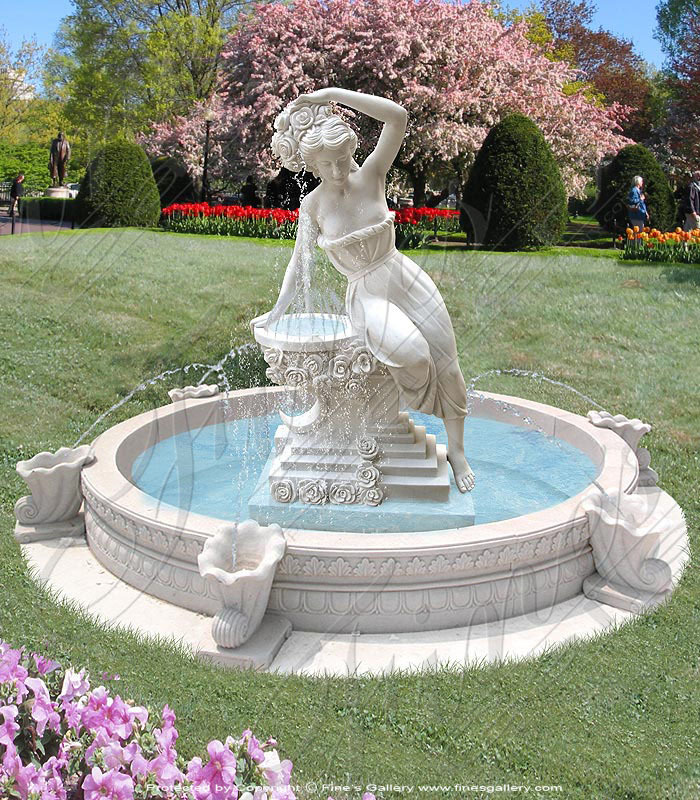 A beautiful hand carved white marble water maiden fountain includes six foot diameter white marble pool and lady with jug fountain feature. Dimensions: H: 72" W: 72" D: 72" View Colors Call Us! 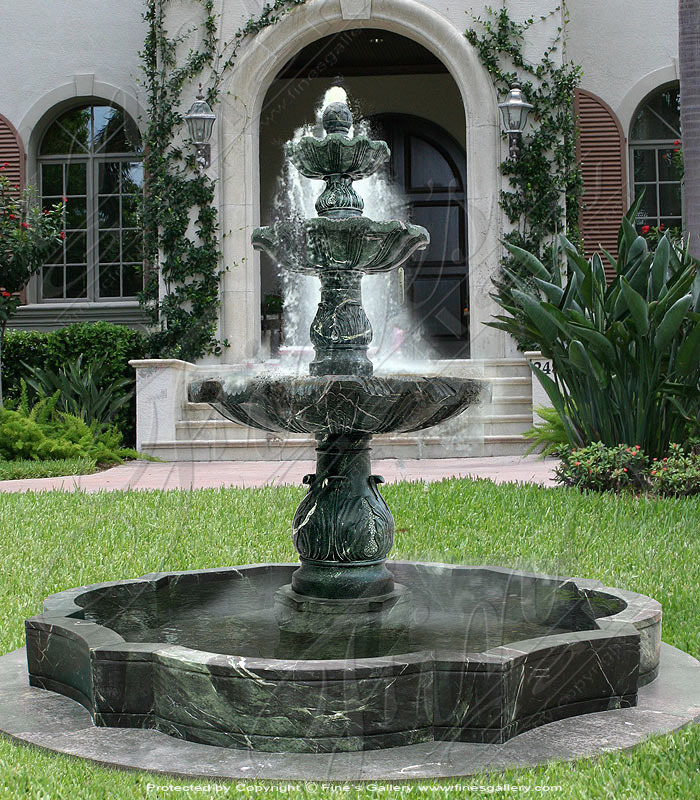 Add special luxury to a garden or outdoor setting with this beautiful marble fountain. 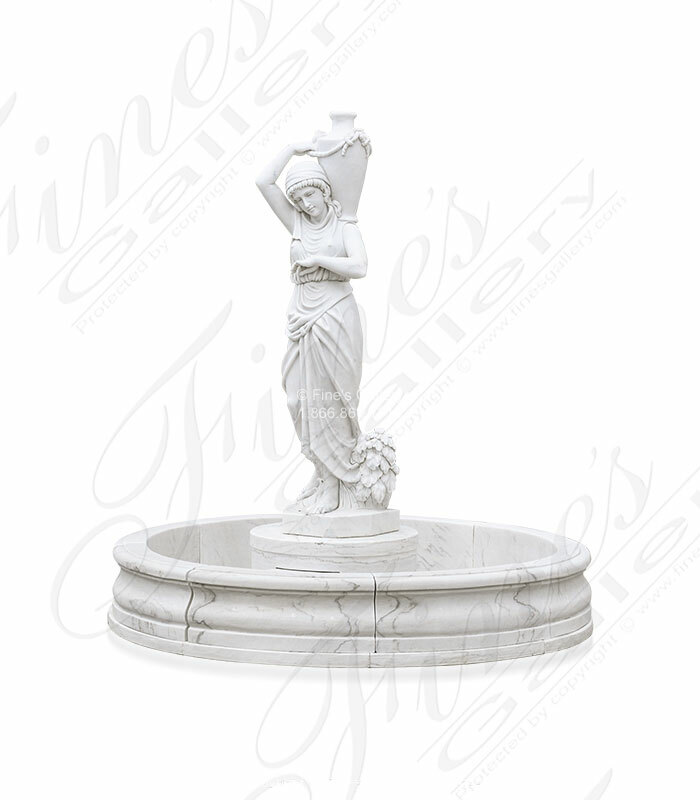 Expertly sculpted from fine marble, this girl is stunning in gorgeous tones of white and green. Water pours soothingly from her basin, leaving lasting impressions. Dimensions: H: 77" W: 32" D: 31" View Colors Call Us! 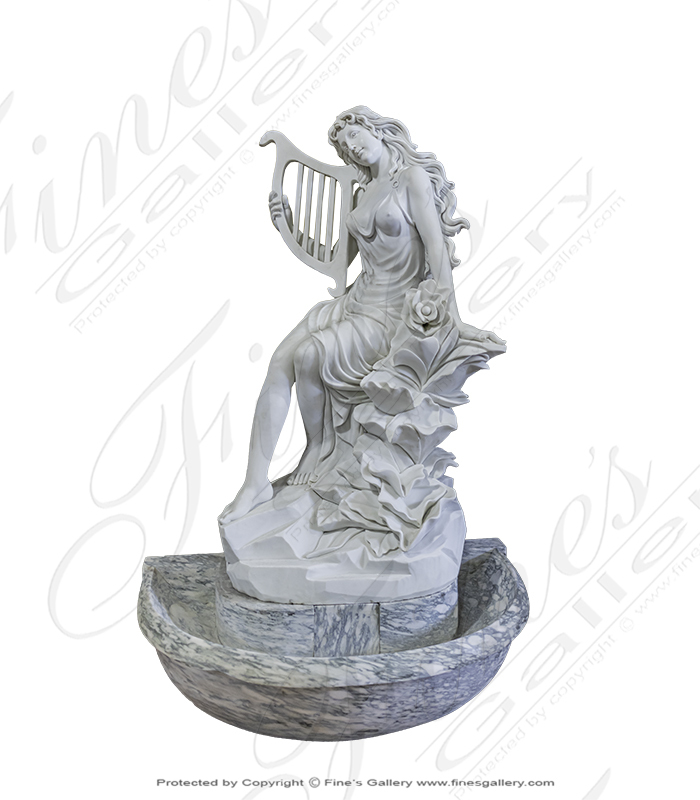 Refreshment pours everlasting from this maiden's vase, her presence creating an outdoor sanctuary full of graceful beauty and soothing water melodies. Dimensions: Call for all available sizes View Colors Call Us! 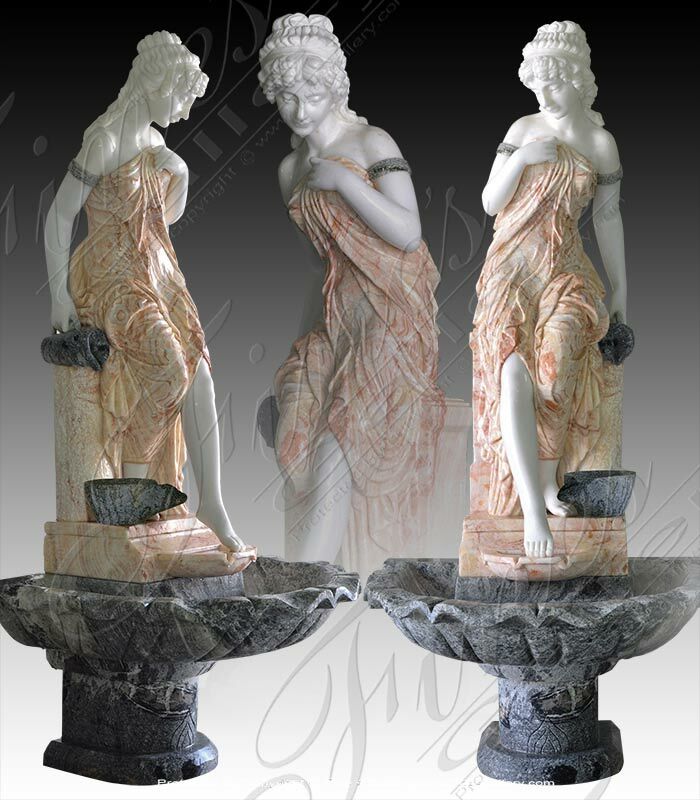 Victorian Lady Marble Fountain Feature. 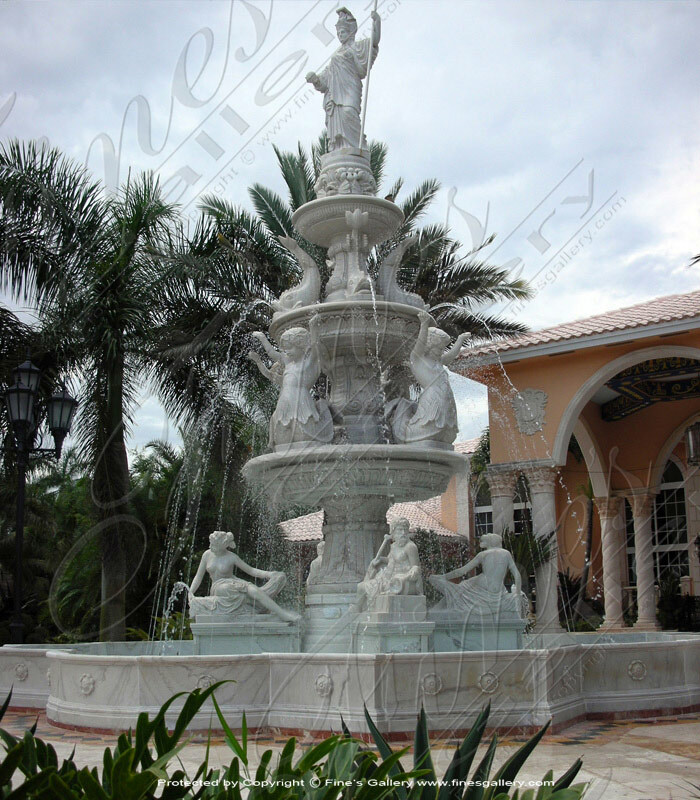 This fountain features a combination of beautiful natural marble. Water pours from her jug to the jug below and spills into larger scalloped edge tier. Dimensions: H: 71" W: 31.5" D: 29.5" View Colors Call Us! 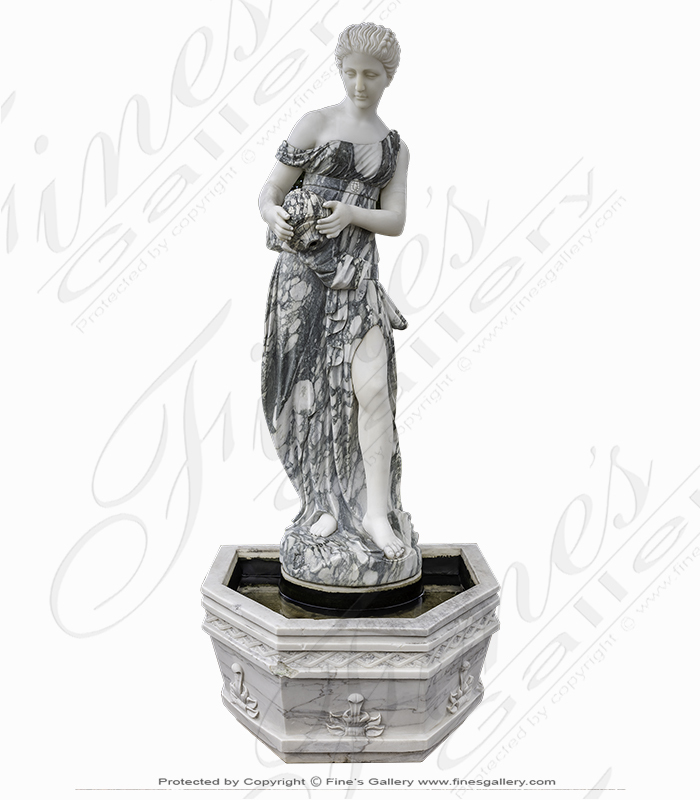 Victorian Woman Marble Garden Fountain hand carved from rare and exotic natural marble. The amazing color combination provides stunning beauty. Perfect for indoor or outdoor garden setting. 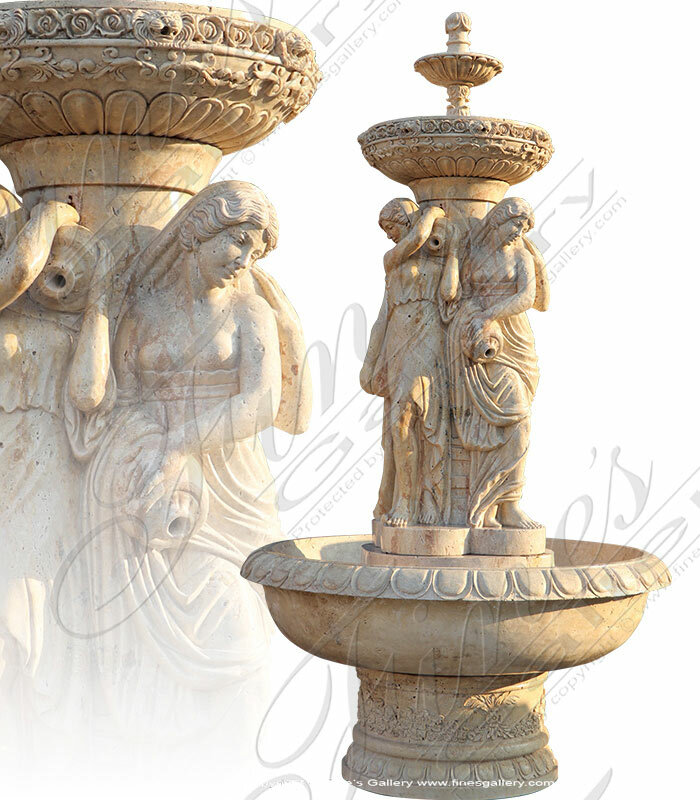 Enchanting Beauty Marble Wall Fountain carved from a stunning pure white marble. The verde green base below collects water that flows down in a stream. 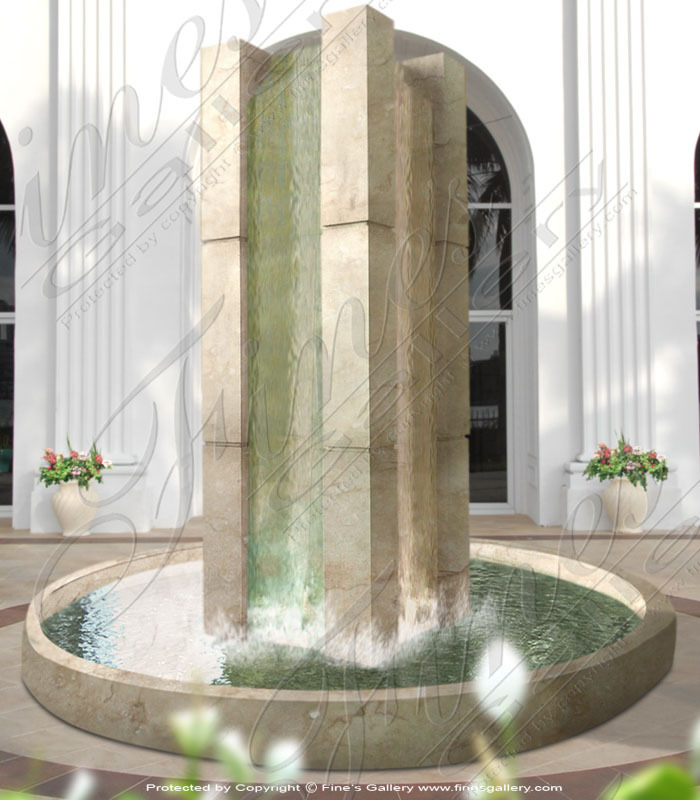 One of hundreds of the highest quality natural stone wall fountains that we offer. Dimensions: H: 71" W: 55" D: 38.5" View Colors Call Us! 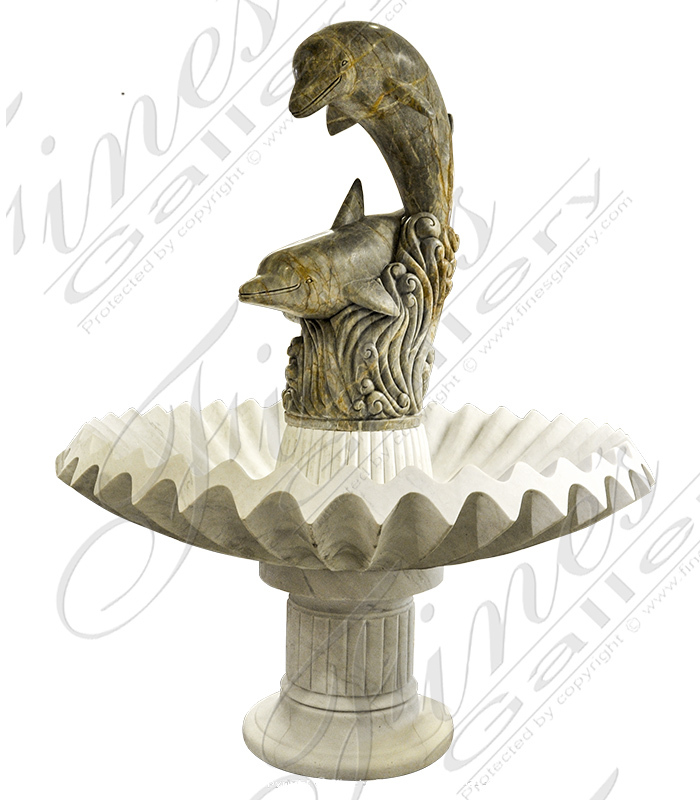 A carved marble dolphin fountain feature, perfect for the side of your swimming pool or central fountain feature. Optional pool surround sold seperately. Dimensions: H: 50" W: 28" D: 23" View Colors Call Us! 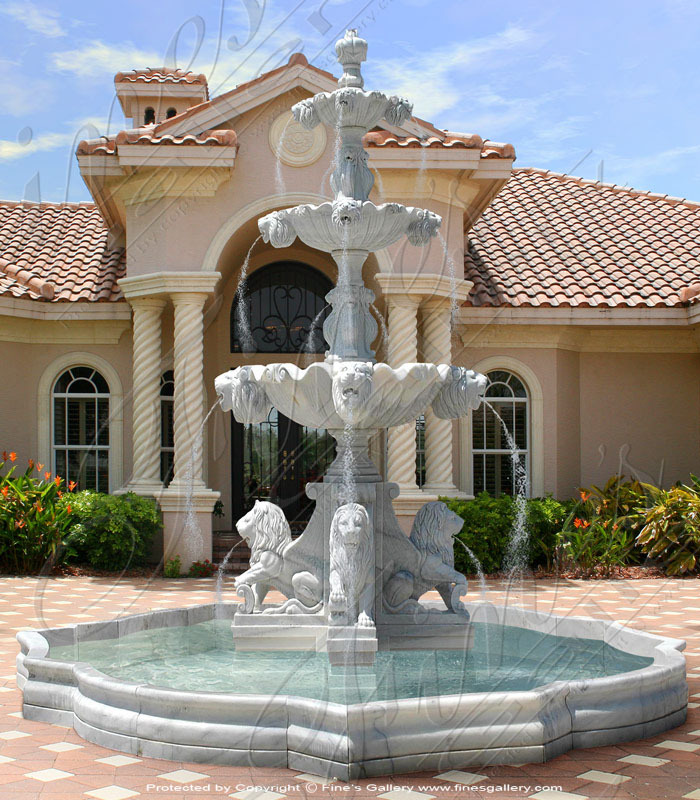 Thank-you for your inquiry of these beautiful fountain products. We will contact you shortly with the information you require. You can also contact us by telephone and talk with a sales respresentative at 1-866-860-1710.